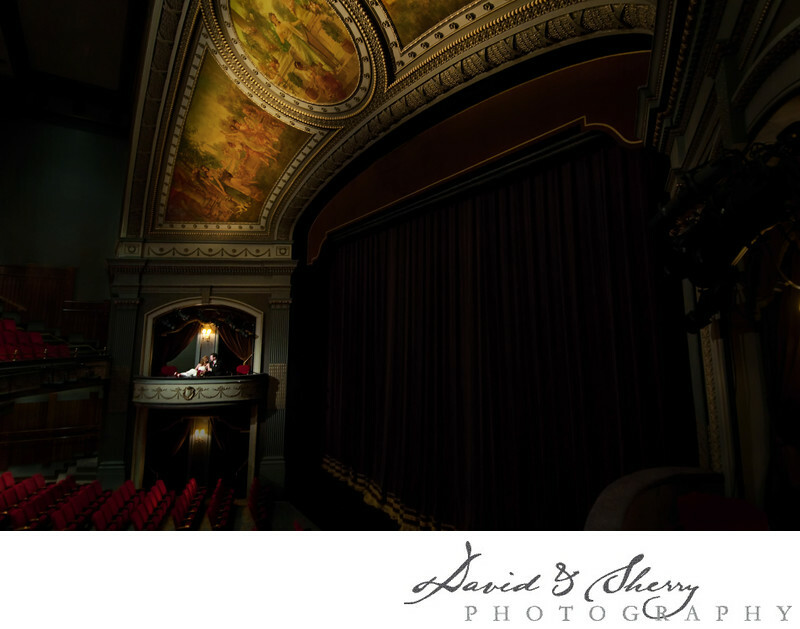 One of the most beautiful wedding ceremonies we have ever been to was Grand Theatre Wedding in London, Ontario. Not often thought of as a ceremony location this central downtown building is one of a kind in the area. The great artwork and design of the interior of this operational show theatre boasts a large space and unique experience for the guests. We of course love it because the pictures that come out of a venue like this are stunning. With it's red covered seats and illuminated art work above the stage we are compelled to be inspired in our photography. In this particular photo we have placed the bride and groom in one of the VIP boxes to the left of the stage and have illuminated them with a video light from the seating area. This allows them to pop off the page of the picture and the leading lines from the stage and artwork bring the viewer's attention right down to this couple in love. Our clients chose to get married in the seating area so they could have the background of their first kiss be the stage, rather than getting married on the stage as some do. It's proximity to the downtown venues, specifically the London Club which is right next door makes this a perfect spot for a stylish couple wanting a luxury wedding with unique experiences for their guests. The Grand Theatre is located in London, Ontario. Location: 471 Richmond St, London, ON N6A 3E4.